The reality of retail business is that in most cases, to have a product out of stock means to lose customers. Here quality inventory management is what really matters. The Low Stock report gives you the power to monitor stock effectively and ensures your customers get what they want each time they come to buy from you. Better stock management in Magento 2 is very important. If you are not aware about your low inventories, and if you can’t make the stock available at prior, your potential customer may go away. It would be very helpful if you can get notified when any out of stock product gets back in stock and available for purchasing. Magento 2 provide you that such kind of feature. You can get all information about limited stock or out of stock product. The business is terribly hampered if customer see the low stock product. If you have various kinds product, it is very difficult to manually manage the product inventory. Those many developers develop Low stock notification extension depends on Magento low stock report. We also develop an extension. Now-a-days Inventory management is very easy. You can be notified your product stock and purchase or produce according to the customer demand which reach your business to a new era. For getting Low stock product we have to follow some steps those are bellows. First we need to set up the inventory level of a product at which it will be considered as low stock. Login to admin panel and browse to stores >> Configuration>>Catalog >> Inventory. Scroll down to the Catalog tab and click the stock section to open it. 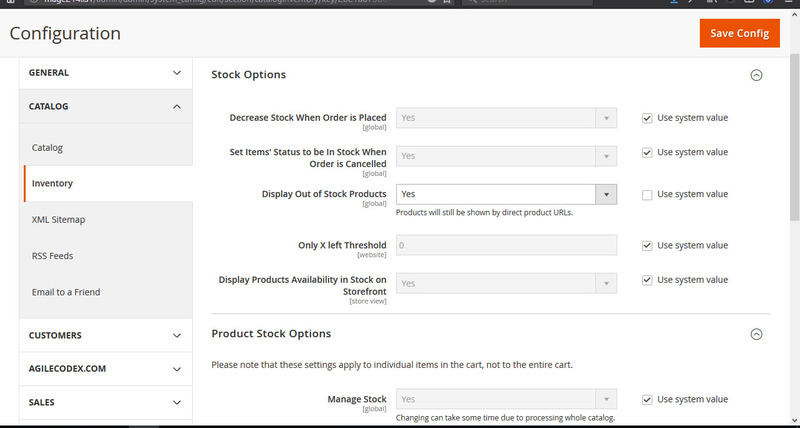 Now expand the ‘Product Stock Options’ section. You have to first understand the requirement of your client and the demand of your product. According to your consumption you have to determine the product low stock threshold value. Set up all requirements of stock low and set threshold of low stock. You can get all of the low stock product. When stock level is lower than the threshold. Go to Navigation Panel and navigate Report >> Low stock. And select the desire store view. Here you can find list of low stock with their current quantity and initial quantity.